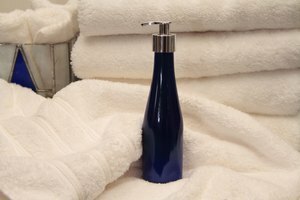 Body lotion is a type of moisturizing cream that can be used anywhere on the body. It is manufactured by cosmetics brands and is available in different packages, scents and formulas. There are lotions that are specifically formulated for sensitive skin, lotions that add a hint of color to the body and those that contain shimmer or glitter. The main objective of all these types of lotions is to moisturize the body and remedy dry skin, especially in the winter months or for people who have naturally dry or flaky skin. Body lotion helps the skin by moisturizing it to make it appear and feel smoother, softer and more supple. It also alleviates the pain and removes the flakiness of extremely dry, cracked skin to make it appear beautiful and healthy. Furthermore, it helps the skin age much slower because highly moisturized skin is known to stay younger-looking much longer than dry skin. In fact, lack of moisture makes skin more prone to wrinkles and premature aging. Body lotion provides the skin with a protective layer against outside forces that are damaging to the skin, such as sunlight and pollution. It is important to choose the right body lotion based on a person's skin type. Extremely dry skin types will benefit the most from a thick and creamy body lotion that will provide the maximum amount of moisture. The lotion should be applied at least twice a day wherever the skin is the most dry, particularly on elbows and knees. Oily skinned people should pick a water-based body lotion to provide a dose of moisture without clogging the pores and causing pimples or other types of acne.